Trellick Tower, Kensington - Ringtail Emergency Lighting. Trellick Tower is a block of flats in North Kensington, London, England. Designed in the Brutalist style by Erno Goldfinger, Trellick Tower is a celebrated piece of 20th century architecture and a listed Grade II* structure. The tower, a 31 storey apartment slab, built as part of a post war housing complex known as Cheltenham Estate was commissioned by Greater London Council in 1966 and completed in 1973. Decades later, it is now a pop culture icon often featured in films and music videos. 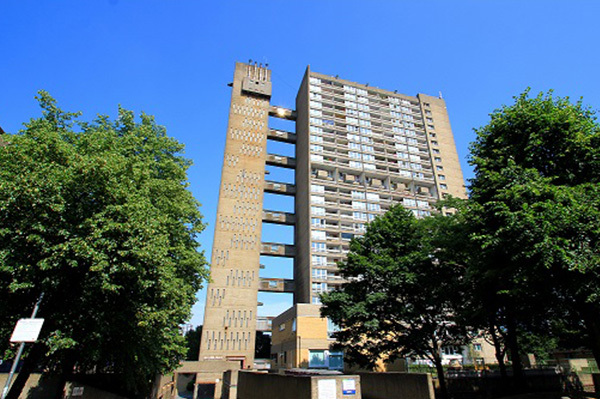 The tower and surrounding estate are admired for their classic geometry, structural rationalism and use of concrete and in 1988 Trellick Tower was awarded a Grade II* listing by English Heritage. Although the tower is an attractive place to live now, its troubled history has given it a slightly gritty edge, one which appeals to some city dwellers. It featured regularly in the tabloids, and the stories of what was to be found in its brutalist corridors were terrifying. Most of which was a result the building being horrendously expensive to maintain, therefore ending up being neglected. Today, however, retro architecture and iconic value have transformed Trellick Tower into a highly desirable place to live and subsequently huge investments have been made in order to continue the operation of such a notoriously expensive building. Ringtail’s brief was to present high quality, energy efficient, cost effective, bespoke units exclusively for use in the emergency lighting system. In any type of mass housing structure emergency exit and safety requirements are always strict; however Trellick Tower was historically unable to meet fire and safety regulations without undergoing major modernisation. This problem is now compounded by the structure being a Grade II listed building. Any sort of improvement or infrastructure development would have an obligation to preserve the original character and design of the structure. Therefore all Ringtail Lighting’s units would have to pass intense scrutiny before being specified for the project. Additionally the sheer cost of maintenance was a cause for Trellick Tower spiralling into disrepair and poverty years after it was opened, therefore cost effectiveness and energy efficiency are two major considerations in any refurbishment work in the modern day Trellick Tower. Ringtail Lighting has supplied four ranges of specially designed units for use in Trellick Tower. Our CS range 8W Maintained emergency exit signs have been supplied for use in all main circulation walkways. Alongside our standard option CS light, Ringtail has supplied a bespoke Pattress option allowing the unit to be fixed, mounted and suspended from a 20mm conduit cable, therefore not damaging or altering any structural or aesthetic fabric of the building. Both CS units provide a seal up to IP65 and pass a hotwire test as defined by ICEL making the units suitable for incorporation into a legal lighting system complying with BS5266-1:2005. All CS range units supplied in Maintained option ensure the correct levels of light are reached at all times. Ringtail’s standard ER28 28Watt units have been placed on all final exits in the complex. Protected up to IP65, the ER28 is a tough waterproof unit and is ideal for exterior use. Our recessed ER28R units have been supplied for use in the ground floor entrance area. All ER28 and ER28R units have been supplied in a Non-Maintained option; Non-maintained lighting is preferred in instances where power consumption and cost are dictating factors, as is the case in Trellick Tower. Our TPX2 Lights have been designed exclusively for use on all main staircases in Trellick’s iconic service tower. Ringtail Lighting presented an innovative and unique design to overcome an issue presented by the building’s retro architecture. The issue was that all stairwells had to be illuminated constantly; also emergency lighting was needed for use in the event of a power failure or an emergency. However the dated electrical wiring on each half landing provided only one access point, where ideally two were needed. The solution was to integrate two lighting systems into one unit, one mains system and one emergency system. A 2 x 24W PL light source produces high levels of illumination needed for regular stairway use and Incorporated into the same unit are 2 x 3W LED’s for emergency backup. In the event of an emergency or power failure the two 3W LEDs will independently provide additional illumination to upward and downward stairwells with adequate light levels for safe evacuation. The inclusion of Ringtail Lighting’s products have greatly improved safety, functionality and efficiency of the emergency lighting systems in Trellick Tower without compromising the architectural value or historical importance of the structure.